This Joint Venture Agreement lets you create a legal documentation between two parties who decide to work together on a Mutual Project. The agreement details the various responsibilities belonging to the parties as per the nature of the project. It also outlines the way in which the Profits will be shared, and the structure of the Profit Sharing, as well as the sharing of any loss, incurred. It also outlines the structure of the Shareholdings between the two parties. 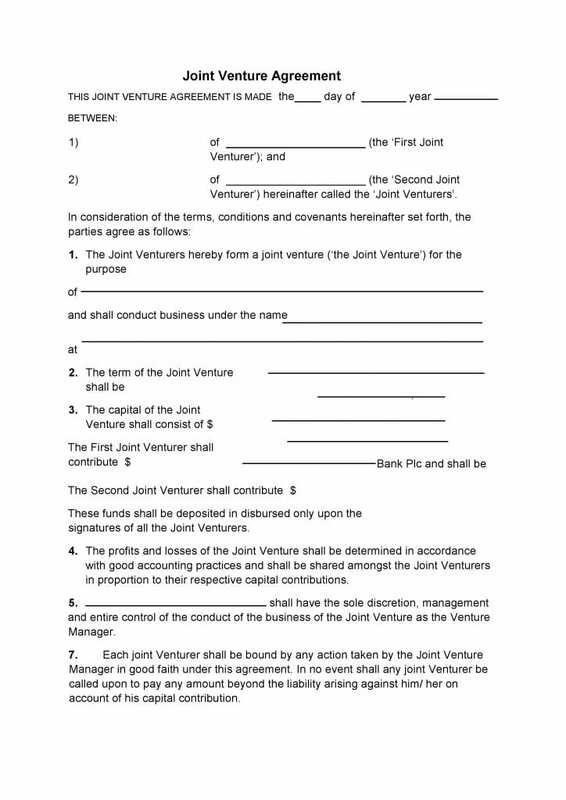 The date on which this joint venture agreement is being entered upon along with the name of both the first and the second joint venture together called the joint Venturers. The purpose for which this joint venture is being formed along with the name of the business and the location of the office of the business. You will also have two filling the term of the joint venture i.e. the start date, the end date and the total number of months/years for which this agreement is valid. The amount that will form the capital for this joint venture in US dollars along with a breakdown of the amount that will be contributed by both the first a joint and second joint venture. The profits and losses of this joint venture will be shared amongst the joint Venturers according to the original contribution made by that venture during the start of this agreement. Both the parties will appoint one person who will have the sole discretion, management, and control in conducting the business of the joint venture, this person will be termed as the venture manager. Each joint venture is bound by any action taken by the joint venture manager under this agreement. The venture manager will not be held liable for any errors in judgment or mistake caused in good faith in exercising the power and authority as venture manager. But the venture manager can be liable for gross negligence or wilful default. This agreement is in no way construed to create a partnership between the joint venture or to authorize any venture as an agent for the other. This agreement cannot be assigned to a third party without the prior written consent of the joint Venturers. This Joint Venture Agreement is applicable in all states. It is recommended that you read each clause in this agreement and amend or modify it according to your own requirements. You can easily download this form by clicking on the link below.